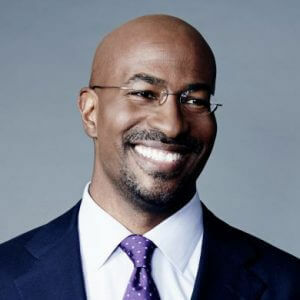 Van Jones is a CNN political commentator, regularly appearing across the network’s programming and special political coverage. The founder of Dream Corps, Rebuild The Dream, Green For All, the Ella Baker Center for Human Rights, and Color of Change, he is presently a fellow at the MIT Media Lab. A Yale-educated attorney, he is the author of two New York Times best-selling books, The Green Collar Economy (2008) and Rebuild the Dream (2012). The second book chronicles his journey as an environmental and human-rights activist who became a White House policy advisor. In 2009 Jones worked as the green jobs advisor to President Barack Obama. He was the main advocate for the Green Jobs Act signed into law by George W. Bush in 2007. This Act was the first piece of federal legislation to codify the term “green jobs.” During the Obama Administration the legislation resulted in $500 million in national funding for green jobs training. In this role Jones helped to lead the inter-agency process that oversaw the multi-billion dollar investment in skills training and jobs development within the environmental and green energy sectors. He has been honored with numerous awards and has been spotlighted on several lists of high achievers. To name just a few: a 2005 World Economic Forum “Young Global Leader”; one of Rolling Stone’s 2012 “12 Leaders Who Get Things Done”; one of TIME’s 2009 “100 Most Influential People in The World”; and one of The Root magazine’s 100 Honorees in 2013 and 2014. Jones is a graduate of the University of Tennessee at Martin and Yale Law School. Van Jones is a charismatic and visionary speaker who argues that a new kind of economy must be built, an economy rooted in our neighborhoods and reflecting their complex cultures. He asserts that the economic is not separate from—but an intimate part of— the cultural; ignoring that fact has contributed to our current crises.